KENNEDY SPACE CENTER, FL – SpaceX announced Sunday (Jan. 29) a significant shuffle to the Falcon 9 launch schedule, saying that a key NASA mission to resupply the space station is moving to the head of the line and will now be their first mission to launch from historic pad 39A at the Kennedy Space Center – formerly used to launch space shuttles. The late breaking payload switch will allow SpaceX, founded by billionaire CEO Elon Musk, additional time to complete all the extensive ground support work and pad testing required for repurposing seaside Launch Complex 39A from launching the NASA Space Shuttle to the SpaceX Falcon 9. Blastoff of the 22-story tall SpaceX Falcon 9 carrying an unmanned Dragon cargo freighter with NASA as customer on the CRS-10 resupply mission to the International Space Station (ISS) could come as soon as mid-February, said SpaceX. “SpaceX announced today that its first launch from Launch Complex 39A (LC-39A) at NASA’s Kennedy Space Center in Florida will be the CRS-10 mission to the International Space Station,” said SpaceX in a statement. Crews have been working long hours to modify pad 39A and get it ready for Falcon 9 launches. Also, the newly built transporter erector launcher was seen raised at the pad multiple times in recent days. The transporter will move the rocket horizontally up the incline at the pad, and then erect it vertically. “This schedule change allows time for additional testing of ground systems ahead of the CRS-10 mission,” SpaceX announced in a statement. The surprise switch in customers means that the previously planned first Falcon 9 launch from pad 39A of the commercial EchoStar 23 communications satellite is being pushed off to a later date – perhaps late February. Until now, EchoStar 23 was slated to be the first satellite launched by a Falcon 9 from Launch Complex 39A on NASA’s Kennedy Space Center. It could have come as soon as by the end of this week. However, the Falcon 9 launch date from pad 39A has slipped repeatedly in January, with this week on Feb. 3 as the most recently targeted ‘No Earlier Than’ NET date. SpaceX successfully resumed launches of the Falcon 9 earlier this month when the first flock of 10 Iridium NEXT mobile voice and data relay satellites blasted off on the Iridium 1 mission from Vandenberg Air Force Base in California on Jan. 14, 2017. NASA now gets the first dibs for using pad 39A which has lain dormant for nearly six years since Space Shuttle Atlantis launched on the final shuttle mission STS 135 in July 2011. SpaceX leased pad 39A from NASA for launches of the Falcon 9 and Falcon Heavy back in April 2014 and was already employing pad 40 on Cape Canaveral Air Force Station for Falcon 9 launches to the ISS. The last Dragon resupply mission to the ISS blasted off on July 18, 2016 on the CRS-9 mission. The Falcon 9 first stage was also successfully recovered via a propulsive soft landing back at the Cape at night. The last successful Falcon 9 launch from Space Launch Complex-40 took place on Aug. 14, 2016, carrying the JCSAT-16 Japanese communications satellite to orbit. But following the unexpected launch pad explosion on Sept 1, 2016 that completely destroyed a Falcon 9 and the $200 million Amos-6 commercial payload during a prelaunch fueling test, pad 40 suffered extensive damage. Furthermore it is not known when the pad will be ready to resume launches. 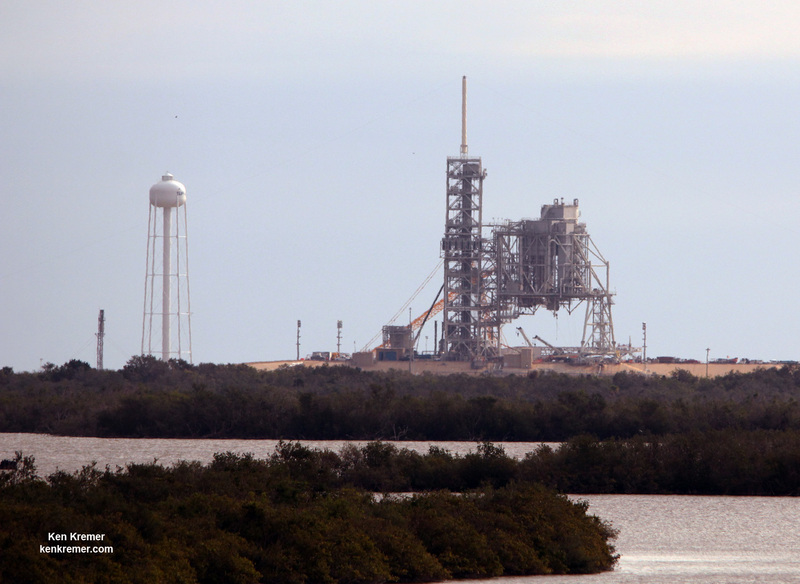 So SpaceX has had to switch launch pads for near term future flights and press pad 39A into service much more urgently, and the refurbishing and repurposing work is not yet complete. Thus the current launch target of mid-February for CRS-10 remains a target date and not a firm launch date. EchoStar 23 is next in line. “The launch is currently targeted for no earlier than mid-February,” SpaceX elaborated. The history making first use of a recycled Falcon 9 carrying the SES-10 communications satellite could follow as soon as March, if all goes well. Previous PostPrevious What is a Planet?